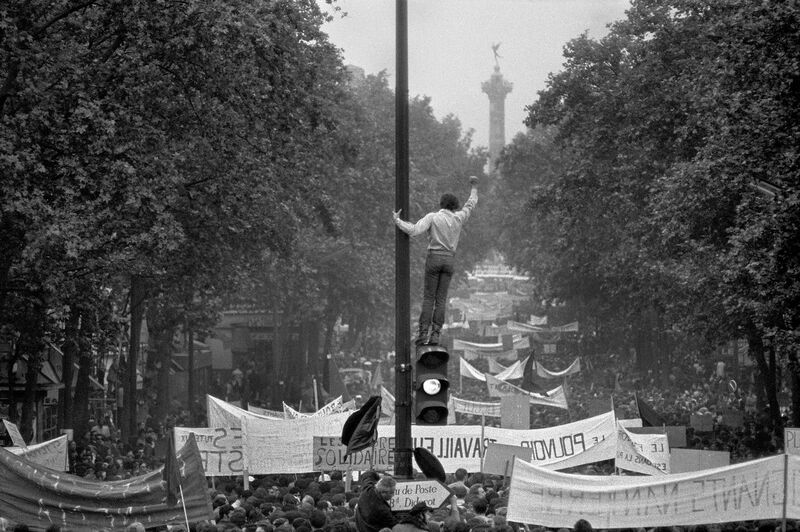 One million demonstrators walking towards the Place de la Bastille, May 13th, 1968 Copyright Bruno Barbey. Magnum Photos. Stephen Bulger Gallery is pleased to present "Witness of Things Past", our first solo exhibition of work by the internationally renowned Magnum photographer Bruno Barbey. This exhibition offers a survey of some of Barbey's best-known black and white photographs as well as colour works made over the course of his remarkable career. Barbey's professional career began in the early 1960s when, over a four-year period, he photographed his series "The Italians". Barbey perceived the Italian people as protagonists of a 'theatrical world' and aimed to capture the spirit of a nation through his striking black and white portraiture. This series presents a modern Commedia dell'arte of beggars, priests, nuns, carabinieri, prostitutes, Mafiosi, and other archetypal figures whose exotic charms stand as a testament to the life and times of Italy in the 1960s. The resulting book remains on the short list of many photography experts and continues to entrance readers to this day. Over the past five decades, Barbey has photographed on all seven continents and documented wars and conflicts in Nigeria, Vietnam, the Middle East, Bangladesh, Cambodia, Northern Ireland, Iraq, and Kuwait. The colour photographs in this exhibition feature Barbey's work from abroad and show the exceptional talent he has for capturing the human condition all around the globe. Barbey's striking use of colour gives insight into the lives of his subjects and proves him to be a modern master of photography. Bruno Barbey (born 1941, Morocco) has dual nationality, French and Swiss. He studied photography and graphic arts at the École des Arts et Métiers in Vevey, Switzerland. His work was recently the subject of a retrospective exhibition at La Maison Européenne de la Photographie, Paris, which is currently touring internationally, and of a major monograph entitled Passages, which was published simultaneously. Barbey has received numerous awards for his work, including the French National Order of Merit. In 2016, Barbey was elected a member of the French Academy of Fine Arts, Institut de France. His photographs are exhibited worldwide, held in numerous museum collections, have appeared in major magazines, and he has published over 30 books. Today, he is photographing extensively in China, where he is publishing a book about China from the cultural revolution to today, as well as a new book on the 50th anniversary of the May 1968 protests in France.